"Storytelling is the art of presenting stories through imagination and memory." 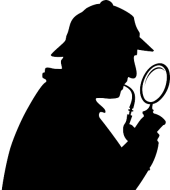 Treat your adult and teen groups with these programs about detective fiction’s most beloved literary character, Sherlock Holmes. Rebecca and Rachel Oshlag of StoriesGalorious present a Sherlock Holmes short story against the backdrop of an absorbing discussion of the detective and the remarkable life of his creator, Sir Arthur Conan Doyle. Like elocutionists of earlier times, these storytellers adhere closely to the written word in their recitation and interpretation of literary works. StoriesGalorious’ Sherlock Holmes programs are perfect for theaters, festivals, special events, libraries, cultural and community groups, high schools and colleges, and independent living residences!